It has been known lately that BDD is a favourable testing approach especially when it comes to building APIs, be it a public API for a variety of client implementations (mobile apps, websites or 3rd party consumers) or using microservices, in both cases the API is the backbone that your data flow relies on so the more robust it is the more reliable it will be which brings us to testing. It connects the human concept of cause and effect, to the software concept of input/process/output. In addition to comparing it to a way to describe the finite state machine which is how I often find myself understanding software. We will be building a sample API using Behat 3.x and Laravel 5.1. After this step we should have vendor/bin/behat there and ready for our commads. 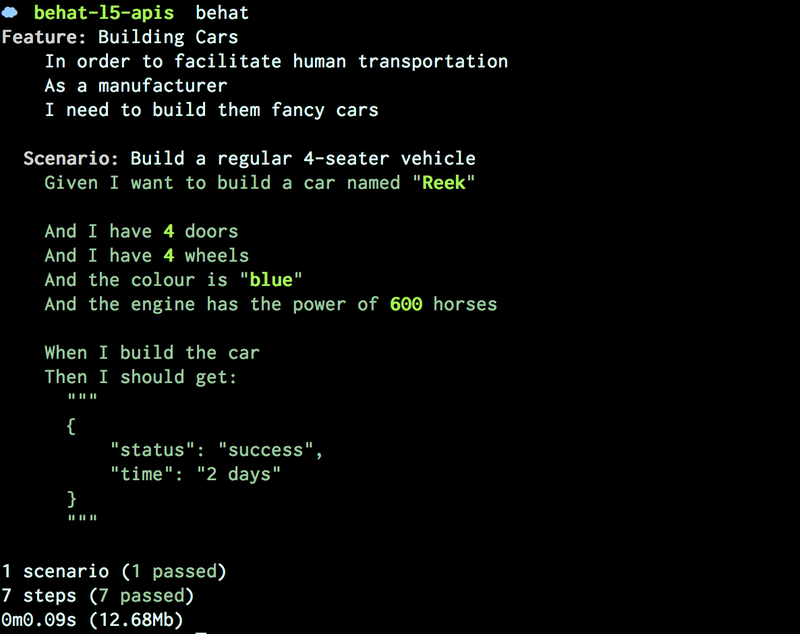 It is handy to add ./vendor/bin to your PATH so that you can call commands without mentioning their full path. Remember to reload your terminal session for the changes to take effect. If you’re not familiar with the Gherkin syntax (it’s the English your write that magically translates into machine language) it’s fairly simple and no, nothing is magical about it and you will realise that as you read along. 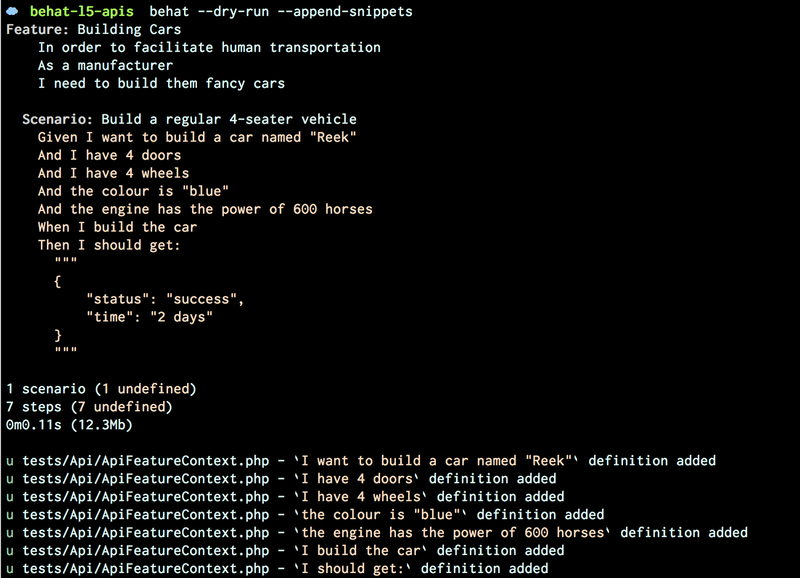 Given I want to build a car named "Reek"
And the colour is "blue"
For more details about the language visit Writing Features — Gherkin Language. We need to tell Behat how to locate our tests, the configuration is in YAML. What this basically says is: “Behat, I have a group of features for the API that I’d like to have them loaded from tests/Api/features and use ApiFeatureContextas my context class”. What is a context class you ask? you’ll know in a bit. Now we go ahead and create the latter. I hear you “we want those too!” so let’s have them available for us in our Context class before diving into the implementation. We will create a “base” feature context calling it LaravelFeatureContext which can be extended if need be. Let’s start writing our first feature test. We will begin using our previous feature example. Now if we take a look at ApiFeatureContext, SURPRISE! The methods that implement the definitions of the Gherkin sentences we just wrote are there for us to implement. Now we need our CarBuilder class, we will be evolving this class as we move on with the tests. Now if we run behat again our first step of the scenario is now green. Finally, this example’s purpose was to give you an idea about how you could setup Behat and Laravel although we haven’t harnessed the powers that Laravel provides, which is what we’ll do in the next part (part 2).